Facebook takes aim at Netflix with original TV shows | What Hi-Fi? Facebook's first original programming could land as soon as next month, sources say. Business Insider quotes "people familiar with the plans" as saying the shows could arrive in mid-June. The line-up is said to number about two dozen shows, with many more greenlit for production. The content will be split into two 'tiers'. Feature-length shows will comprise the upper tier - think glossy, slickly produced dramas to compete with the likes of House Of Cards. The lower tier will consist of shorter, five- or 10-minute segments that will be refreshed every 24 hours. One of the shows is said to follow couples as they go on a date in virtual reality before meeting up in person to go on the real thing. It's being made by Conde Nast Entertainment, the studio production arm of the glossy magazine company. 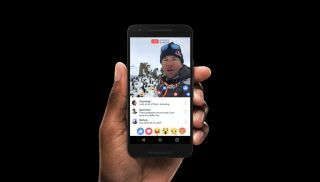 Conde Nast Entertainment has previously announced it was working on a video project for Facebook, but hasn't confirmed what the content will be. Facebook is also targeting A-list celebs, with at least one lined up to star in a show, according to the sources. Facebook is investing heavily in video to try to lure users away from Snapchat. According to one source, "They are obsessed with Snapchat." Snap Inc. - Snapchat's parent company - is also pursuing deals for TV shows for Snapchat's Discover section. Facebook's shows are expected to be unveiled at the Cannes Lions advertising festival, which starts on 17th June. According to one source, however, the launch could be pushed back to later in the year. Facebook isn't the only company investing in original TV programming. Apple and Spotify have both announced original shows in an effort to differentiate their streaming services from rivals.